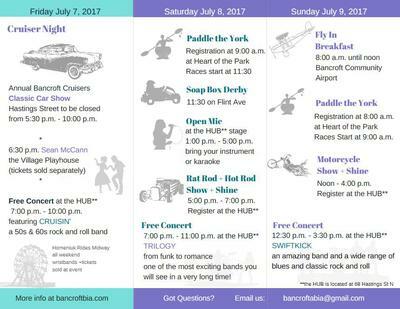 The Wheels, Water & Wings Festival is a weekend of family fun in Bancroft, Ontario, Canada. Held the 2nd weekend in July, this year the festival runs from 6 p.m. on Friday July 7th to 5 p.m. on Sunday July 9th. Free Concerts, Paddles Races, Soap Box Derby, Airplanes, Rat Rods, Hot Rods and a Midway. Sunday concert featuring a blues/rock band and Motorcycle show and shine from noon until 4 p.m. No registration fee. Cash prizes.